Colorado Governor-Elect Jared Polis’ seven transition committees announced upcoming telephone town hall meeting dates as part of their ongoing transition. The Energy & Natural Resources & Agriculture Tele Town Hall is THIS Saturday, December 1st, 2018 from 12:00 p.m. to 1:00 p.m. This Town Hall is very important to CCA and its membership as this committee will be very influential on the decisions made politically toward agriculture in Colorado. Use this opportunity to voice your support for agriculture in Colorado and its importance in the transition process for this new state government. Make sure your voice is heard and invite the transition team to experience animal agriculture first-hand in rural communities and on our local ranches, feedlots, and processing facilities. Take advantage of the opportunity to speak with these committees directly. DENVER — Thursday, Nov. 29, 2018 — Governor John Hickenlooper today announced a $10.33 million ALT Fuels Colorado grant through the Colorado Energy Office (CEO) to ChargePoint to build electric vehicle (EV) fast-charging stations along the state’s major transportation corridors. The fast-charging stations will be located in communities at 33 sites across six Colorado corridors comprised of Interstate, State and U.S. highways. “The 2018 farm bill emerging from the conference committee is good news for farmers amid a prolonged downturn in the agricultural economy. Chairmen Roberts and Conaway and Ranking Members Stabenow and Peterson made the bill a priority for this Congress, and all Americans—farmers and consumers—are better off for it. “Continued access to risk management tools, assistance in foreign market development, and conservation and environmental stewardship programs within the legislation are especially important for farmers and ranchers. These programs will help provide certainty to rural America at a time when it is much needed given the financial headwinds so many family farms now face. Additionally, the bill continues to help low-income children, families, seniors and military veterans access the high-quality foods produced by farm families. “Farmers and ranchers continue to face challenges outside of the farm bill. Every day we struggle to find the workers we need. Exports were once a backbone of U.S. agriculture, but we now face an uphill battle reclaiming our once robust market share. While the Administration is reviewing the cost and effectiveness of federal regulations, overregulation remains a burden that farmers and ranchers cannot afford, especially now. We urge Congress to continue working on these issues to maintain our nation’s food security and continue agriculture’s significant contributions to U.S. job creation and economic growth. “NAWG appreciates conferees diligently working together to reach an agreement to strengthen the agriculture industry. This past year our growers have dealt with the impact of the trade war between U.S. and China, extreme weather conditions, and a struggling rural economy and more. Farm Bill support programs provide them with some certainty during these volatile times. For 73 years now, our Grand and Reserve Champion Junior Livestock Auction Steers have joined patrons in the lobby of the Brown Palace for morning tea. This year, we’re adding a new animal to this fun tradition. The Grand and Reserve Champion Goats are headed to a different iconic site in urban Denver. They will be on display at the Denver Athletic Club on January 17th. Don’t miss your chance to be a part of this inaugural event! Congressional negotiators have reached a tentative deal on the Farm Bill pending final cost analysis by the Congressional Budget Office. Senator McConnell’s Hemp Farming Act language is included in the bill. This will be a game changer for the hemp industry. A farm bill agreement could be announced yet this week. Leadership of the farm bill conference committee reports a deal is close, with a possible announcement this week and a more detailed announcement to follow next week, according to staffers close to the negotiations. A move towards an agreement would set the stage to allow Congress to consider final passage of the bill this year. 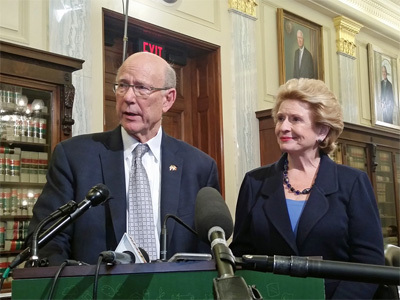 Senate Ag Committee Chairman Pat Roberts says a full agreement depends on the cost analysis. There is little time in the lame duck session to complete the bill, as lawmakers are scheduled to exit Washington by mid-December. Still, all sides appear committed to finishing the bill this year, ahead of a new Congress that offers a change of control in the House of Representatives. Collin Peterson, incoming chairman of the House Agriculture Committee, has previously said he wants the bill done now, before the next Congress, which would likely require a rewrite of the legislation. The Environmental Protection Agency will not reallocate waived biofuel volumes in 2019. The agency denied a request by the corn and ethanol industries to reallocate any biofuel volumes lost to small refinery waivers next year, according to Reuters. Expansion of the waivers, which were unused under the Bush and Obama administrations, threatens demand for corn and corn-based ethanol. The Renewable Fuel Standard requires oil refiners to blend biofuels each year or purchase blending credits. However, the small refiner waivers exempt any refinery that proves complying with the RFS causes them financial strain. The corn industry points out that some of the world’s largest oil companies have received waivers from the Trump administration. Meanwhile, an EPA official this week also said that the 2019 annual biofuel mandate figures were set to be largely in line with the agency’s June proposal of 19.88 billion gallons. Trade groups are expressing concern that the U.S. Department of Commerce has initiated “changed circumstances” reviews of U.S. trade duties on Argentine biodiesel companies. In a letter to President Trump, the groups, including the National Biodiesel Board, urged the president to ensure the Commerce Department undertake a “rigorous, comprehensive and transparent review” before considering any adjustment to the duty rates it established earlier this year. The Department imposed antidumping and countervailing duty orders in January and April 2018, following investigations in which the government found that biodiesel imports from Argentina were massively subsidized and dumped, injuring U.S. biodiesel producers. The letter states that any political concessions to Argentina would “distort U.S. markets and undercut crop prices that are only now regaining stability.” The groups opposed the initiation of the changed circumstances review, arguing the Commerce Department has well-established administrative review procedures for revisiting antidumping and countervailing duty rates. The Department of Agriculture Wednesday announced a $291 million investment to improve rural community infrastructure and essential services. Announced by Assistant to the Secretary for Rural Development Anne Hazlett, the funding will improve rural communities for 761,000 residents in 18 states and Puerto Rico. USDA is investing in 41 projects through the Community Facilities Direct Loan Program. The funding helps rural small towns, cities and communities make infrastructure improvements and provide essential facilities such as schools, libraries, courthouses, public safety facilities, hospitals, colleges and daycare centers. Hazlett says of the projects that “modern community facilities and infrastructure are key drivers of rural prosperity.” For more information and a list of projects funded, visit www.rd.usda.gov. To assist farmers, ranchers and rural communities hurt by wildfires, floods and other natural disasters, the California Farm Bureau Federation has established a Farm and Rural Disaster Fund. Created under the California Bountiful Foundation-a charitable foundation established by the California Farm Bureau, the fund will collect contributions to aid communities affected by natural disasters. California Farm Bureau President Jamie Johansson says the fund comes at the request of state Farm Bureau members to “provide aid to farms, ranches and rural communities that have suffered losses.” In addition, county Farm Bureaus in the state have begun relief efforts specific to the Camp Fire that continues to burn. The fund will accept donations dedicated to feeding, housing and maintaining livestock displaced by the fire that are being cared for at the county fairgrounds. Learn more about both efforts at CFBF.com.